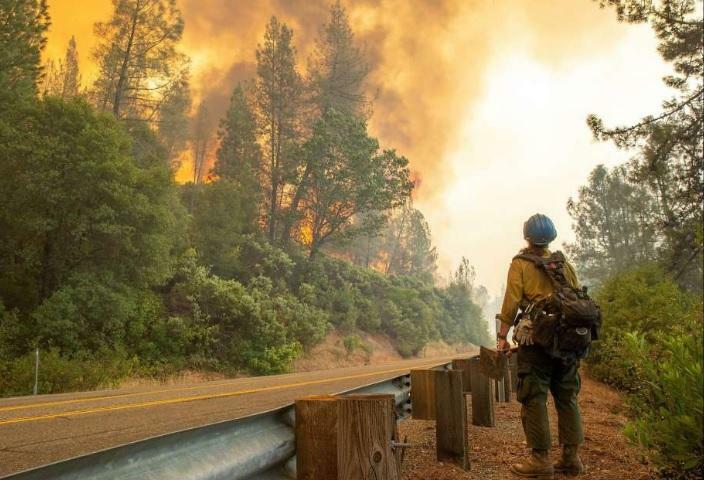 Deadly firestorms are raging across parts California prompting a massive effort to evacuate residents and save properties from the expanding inferno. California Department of Forestry and Fire Protection held a news conference Friday and gave an update on their efforts fighting the Carr Fire that is currently ravaging Redding, California. The path of destruction left behind by the raging firestorm is reminiscent of a scene from a disaster film as smoldering remains of once beautiful neighborhoods stretch for miles. The fire has destroyed dozens of homes and killed one firefighter and a private bulldozer operator. 38,000 residents have been given evacuation orders as the fire continues to expand threatening 5,000 homes. Cal Fire Deputy Chief Scott McLean said during Friday's press conference, "It’s all west of I-5, and we don’t want it to get even near to I-5. People are working on strengthening the line, our aircraft are up and we’re supposed to see decent weather over the fires. We’re taking every advantage that we can." Officials are concerned that high winds could push the fire closer to the central city of 91,000 residents. Redding Police Chief Roger Moore said, "This fire is scary to us, this is something we haven’t seen before in the city. It’s changing direction radically." Marin County firefighters suffered burns to their ears, face, and hands Thursday as they struggled to protect structures when they were hit with a "sudden blast of heat from vegetation adjacent to a structure," according to the department's Facebook. Every year it seems we read and see California has either Wildfires, Mudslides, and/or Earthquakes. Massive Wildfires will become even more common as these people build homes in the mountains and commute in to work. The now yearly Wildfires followed by their usual rainy season have always resulted in massive Mudslides for 1000's of years. Plus California already has a critical drinking / crop irrigation shortage of water. Failing to siphon off/ steal enough water out of the already over taxes Colorado River due to Environment concerns. Yet people flock to this place, which rapidly becoming a inhabitable hell hole.